The purpose of this guidance is to help owners contemplating building works requiring the Committee’s consent to produce proposals that are acceptable to the Committee. However, each application will be considered on its merits and this guidance is for information only. As stated in the Introduction to the Planning section, applicants and/or their professional advisors are encouraged to meet Committee representatives for informal discussions about proposed schemes before a formal application is submitted. Those portions of Wentworth Estate designated as Area A contain individual private houses for family occupation, each separated from every other in a predominantly tree covered setting, giving a rural feel. Please see the Planning Map for specific boundaries. The Committee will not allow sub-division of an Estate plot or mulitple dwellings on a single Estate plot. When considering a planning application, the Committee assesses the relationship with adjoining properties and the Estate as a whole. Any proposed development should be designed and sited so that it does not detract from the character of the Estate. Each Property and any development of it should be in harmony with the size, shape and character of its plot. The size of the new construction is of paramount importance to preserve the character and appearance the size. The size of the proposal will be considered in relation to the size of the plot and it is unlikely that any proposal resulting in the gross area of a dwelling (measured over external walls) exceeding 22% of the area of the plot will be permitted. This is known as the Plot Ratio. This is strongly upheld in the Green Belt area around the golf courses. It is accepted in the roads north and south of Christchurch Road from the roundabout to the shops the Plot Ratio varies and it is recommended to contact the Estate office to establish the particular Plot Ratio for the location in question. The area of the buildings includes garages, swimming pool buildings, garden rooms, (see section on Outbuildings below) and the like; however, in most cases basements, ramps, balconies, lightwells and loft areas will be excluded from the calculation. The siting of a building on its plot also requires careful consideration. The appropriate distance from the boundaries will be influenced by the size, shape and orientation of the house and its ancillary buildings, the proximity and aspect of neighbouring houses and the extent of natural screening. As far as possible the proposal should not affect the privacy of a neighbour’s house and garden or significantly affect neighbours out-look. For example, proposed dormer windows in a loft space should be sited to minimise the degree of overlooking of neighbours’ houses and property. Garages, swimming pools, tennis courts, barbecue areas and the like which may cause noise, smells or other nuisances should be carefully sited to minimise the impact on neighbouring houses. The Committee does not generally concern itself with the design of a building, provided that it is well screened. However the Committee will in its consideration of an application look at the impact of a proposal on the immediate street scene and the overall effect on the Estate if the proposals were replicated throughout the Estate. It is unlikely that the Committee will permit any two storey building to be within 4.5m of any boundary and any single storey building to be within 3.5m of a boundary. The Committee recognises that these plots are generally in roads with a more urban appearance where there are established front and rear building lines. It is the depth of the house which can cause most harm to neighbouring properties. Proposals for new dwellings will need to show reasonable separation distance from the side boundaries. It is anticipated that a distance from side boundaries of 3.5m for single storey and 4.5m for two storey elements will be appropriate for 20m wide plots, reducing on a sliding scale as the plot width decreases. In most cases the rear of the new dwelling should not be appreciably beyond the building line established by adjacent houses. The building should not exceed 9.0m in height. However, as it is important that its appearance is in harmony with street scene, in some cases this may be excessive. The scale and massing of the design should also be in harmony with neighbouring properties. Where plots have frontages greater than 35m wide, the Committee will expect an increase in the separation distance between the new building and its boundaries on a sliding scale from a minimum of 3.5m for single storey and 4.5m for two storey elements. The wider the plot, the greater the separation distance required. It is unlikely that a height in excess of 10m will be acceptable. The Committee recognises that residents are increasingly interested in using basements to enlarge their dwellings within the guidelines for the Estate. It is also cognizant that extensive underground structures will eventually affect the underground movement of water around the estate, potentially resulting in the unpredictable appearance of new above-ground caches of water and/or changes in the size or path of existing water features or the current water table. To address this unpredictable and possibly wide-spread impact, the Committee is currently considering its policies regarding the size and placement of basements. It will now be a requirement for those applying to build a basement to provide a Hydrogeological or Geotechnical Survey (or the equivalent) to confirm the applicant’s knowledge of the underground water conditions and acceptance of all liability for any damage resulting directly or indirectly from the underground construction. The trial holes should be drilled at least to the full depth of the basement. Applicants considering a basement are strongly urged to contact the Estate Office and to speak with the Estate Manager. The Committee will allow single storey basements only, these can include a swimming pool. The size of the basement (excluding lightwells and ramps etc.) must not exceed 22% of the plot area. It is expected there to be a minimum of 3.5m distance from the basement to the boundary. This includes lightwells and ramps etc. It should be noted that where an extension to any existing dwelling or outbuilding the Committee will apply the guidelines on plot ratio, height and separation distances from boundaries as if a new house was being proposed. Outbuildings require the approval of the Committee and the Estate guidelines on Plot Ratio, height and separation distances from boundaries will apply. We will require a scaled Site Plan showing the position of the outbuilding, and elevation plan. Outbuildings must not be used as a separate dwelling or for commercial purposes. In most cases the gross external floor area of any outbuilding such as garaging, swimming pool buildings, garden rooms, security buildings and the like will be included in the Plot Ratio. There are certain circumstances where the floor area of the outbuilding will be omitted from this assessment. The application complies with Class E of the Town and Country Planning (General Permitted Development) (Amendment) Order 2015, Part 1 - Development within the curtilage of a dwelling house. The principal purpose of the outbuilding must be incidental to the enjoyment of the dwelling house. The height to the top of the eaves must be 2.5m max with a maximum ridge height if pitched of 3.5m. The outbuilding must be a minimum of 1m from the boundary and screened along the boundary with evergreen planting. The outbuilding shall not be visible from an Estate road. The outbuilding must be a pre-fabricated structure and assembled on site. An outbuilding constructed on site with brick and/or block construction will be included in the Plot Ratio. The overall size of the outbuilding (Gross External Area) must not exceed 3% of the plot area. The outbuilding must comply and continue to comply with all of the points above to be considered outside the Plot Ratio assessment. The Committee accepts that residents may wish to take steps to enhance the security of their properties. Electronic gates and associated piers will generally be allowed provided that they are set well back into the property. The Committee expect the gates to be proportionate with the house and surroundings, generally they should not exceed 3.5m in height. The piers, including any capping or lantern, should be no more than 3.0m high. Wing walls can detract from the rural character of the Estate and when considering whether they are appropriate the Committee will look at the character of the particular area. In most cases the Committee will insist on evergreen planting to soften the appearances of the walls; in all cases the walls must not exceed 2.0m in height (measured overall including any pier caps, lanterns etc.) and be no more than 3.50m in length. Usually the distance between the piers should not exceed 4m and the bellmouth entrance of at least 6m (1 car length) will be required. The Committee will allow an access to be moved to a new position provided it does not create a traffic hazard or adversely affect neighbouring properties, for example reasonable and safe sight lines. The covenants require boundaries to be defined by post and wire fencing 4’ 6” high with evergreen or beech hedges. However, the Committee will normally accept green plastic coated chain link fencing not exceeding 1.8m high, provided it is adequately screened with an evergreen or beech hedge. Security fencing may be allowed provided that it is of an “open” design (palisade for example), it is green in colour, and it does not exceed 2.0m in height. It must be with evergreen planting so as to be invisible from the road or neighbouring properties. A covenant attached to all properties on the Estate obliges the owner to have prior written approval of the Committee before any tree having a diameter of 9’’ (225mm) or more measured at 2’0’’ (600mm) above the ground is to be felled, this includes dead, dying, dangerous or diseased. The Committee views any breach of this covenant seriously and if trees are felled without prior approval, an owner will be expected to remedy the breach before an application is considered. To protect the character of the Estate, existing trees, shrubs, and landscaping features should be preserved where practicable. If it is necessary to remove trees to carry out a development, the Committee will expect them to be replaced on a “one for one” or in some cases a “two for one” basis (to be determined by the Committee of which their decision is final). The Committee accept for the commonly considered poorer variety of tree for example, silver birch or leylandii/lawson cypress type of conifer replacement trees will not be required. The replacement trees required will be of a reasonable size and quality, typically 4.5 - 5m in height (approx 16 - 20cm girth). Garden and security lighting can be very obtrusive if it is not designed sensitively. Care should be taken to minimise its impact on neighbouring properties and prevent unnecessary light pollution of the sky. Security cameras should capture areas within the property only and not any neighbour or Estate verge or road nor any part of the golf course. Cameras at entrances are to be directed and restricted to the bellmouth only. The Committee is aware of the changing attitudes towards renewable energy solutions, for example solar or photovoltaic panels or air/ground source heat pumps. In accordance with the Estate covenants, the installation of such devices is considered an external alteration that requires the Committee's approval. The Committee allows such projects; however the positioning of panels on roof slopes that face towards the private roads will not be acceptable. Even if the property is screened by foliage and/or trees or new screening is proposed, panels facing towards the roads will not be approved. The units of certain air or ground source heat pumps can cause noise pollution. The Committee will not permit the positioning of such within 3.5m of the boundary unless they are professionally sound proofed. Solid hoarding should be no more than 2m high and painted in dark green or black. No other colours are permitted. A notice to advertise the property for sale or for let is permitted but shall be limited to a maximum of two placards no more than 6’ x 4’ in size for properties with two accesses and/or over one acre on the property (not verge) only. For properties with only one access and/or less than one acre, only one placard not more than 6’ by 4’ in size is acceptable. No notice or placard can be erected facing towards the golf course. The Committee reserves the right at any time to remove any board contravening the above. The Committee recognises the right of an owner to improve his property. At the same time, it is aware of the nuisance building works cause to neighbours and has in place a number of measures designed to minimise this. Before any work commences on site, owners are required to enter into a Deed of Agreement with the Committee, which imposes a number of conditions intended to minimise nuisance to other residents during building works. Particular attention should be drawn to the financial consequences to the owner if a contractor breaches the conditions imposed. It is suggested that owners incorporate the conditions of the deed in their contract with their builder. Before work commences on the site, a meeting will be arranged between the applicant and/or his professional advisors, the appointed contractor, a representative of the Committee and a representative from Cannons Security who police the construction sites. This meeting will ensure that all parties understand the need for the conditions imposed by the Deed of Agreement and the consequences if they are ignored. The Committee will erect a notice board on the verge in a prominent position at the site entrance at the commencement of building works displaying a copy of the working rules set out in the Deed of Agreement, so that contractors and sub-contractors are in no doubt about their obligations. A representative of the Committee will inspect construction work from time to time to ensure that it complies with the approved drawings. The owner will be informed of any discrepancies and asked to submit revised drawings for consideration by the Committee. Statutory Instrument 1990 No. 2617 made by the Secretary of State empowers the Committee to revalue any property for the purpose of calculating the annual road rate following the completion of any development. 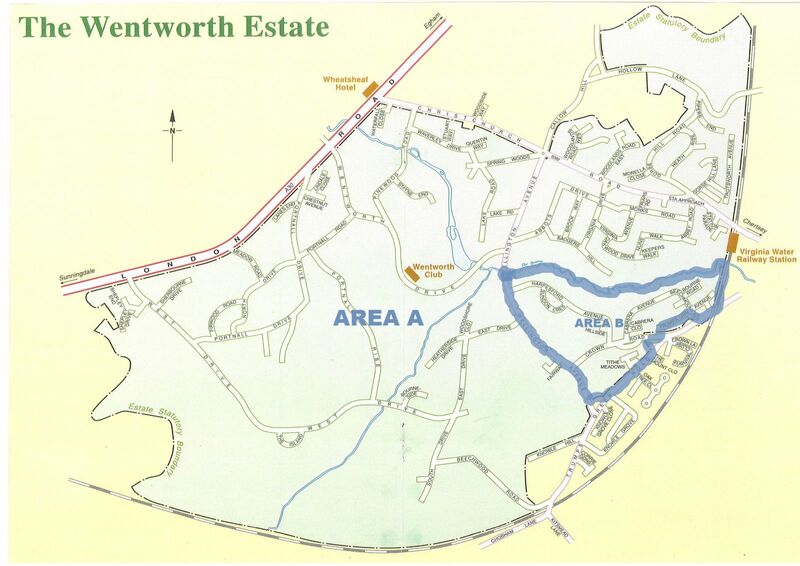 Those portions of Wentworth Estate designated as Area B contain detached and semi-detached dwellings fronting onto roads adopted and maintained by Runnymede Borough Council. Please see the Planning Map for specific boundaries. When considering a planning application, the Committee assesses its impact upon adjoining properties and the Estate as a whole. Each Property and any development thereof must be in harmony with the size, shape, and character of its plot and neighbouring properties. When assessing a planning application the Committee will pay particular attention to the effect the proposals may have on neighbouring properties. The Committee does not generally concern itself with the design of a building. However the Committee will in its consideration of the application look at the overall effect on the Estate if the proposals were replicated throughout the Estate. No building is to be within 1.0m of any boundary. However, when assessing what is a suitable distance for a particular plot, the Committee will consider the size and shape of the house, the proximity of neighbouring houses, and the extent of natural screening. The Committee reserves the right to inspect construction work on completion to ensure that it complies with the approved drawings.